Image caption The Hexagon Theatre will host the Shoot-Out event, run by World Snooker, in February. 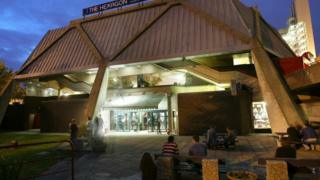 The Hexagon Theatre in Reading will host its first major snooker tournament in more than 20 years. The Queens Walk venue will welcome the Shoot-Out event, organised by World Snooker, in February. The competition, to be shown by ITV4, will feature 64 leading players in a knockout format. The Hexagon, described by World Snooker chairman Barry Hearn as a "fabulous venue", previously held the Grand Prix tournament from 1984 to 1993. The Shoot-Out event is due to run at the council-owned theatre for three years.